When I opened up my first Bundle from FotoBella.com, I was delighted to see that I received the Vivienne "I want it all Bundle" from Basic Grey! The colors in this collection are gorgeous! And the patterns on the Designer Paper are reminiscent of beautiful quilt fabrics you might find in your Great Grandmother's old trunk. Soft beautiful pastels, contrasted with deep browns and earthy pale yellows...It is simply yummy! There are lots and lots of coordinating embellishments with the Vivienne "I want it all" Bundle, so many that they barely fit in the photograph! But good news! To help you keep everything together and organized your Bundle is delivered inside of a handy FotoBella Storage Organizer! How great is that?! Included is this gorgeous Designer Paper, (24 sheets and 3 sticker sheets), Die cuts and Transparencies, Chipboard shapes and Alphas, and cute little Frames with acetate overlays. 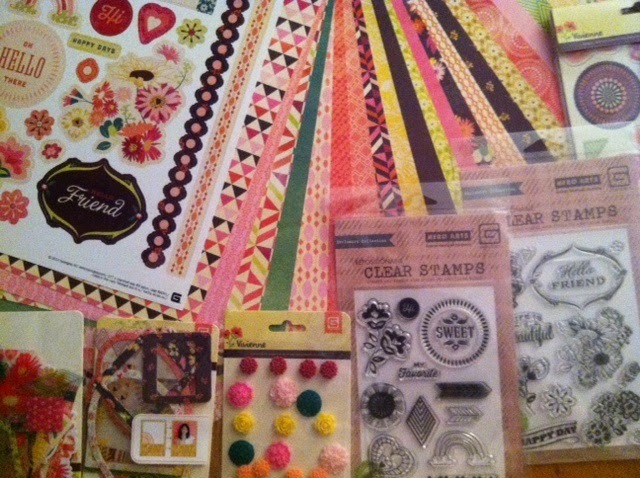 There are Resin Flowers, Laser Wood Stickers, and 2 sets of Hero Arts Stamps (Good Day and Sweet You). Buying a Bundle is definitely the best way to save money on your favorite Paper Collections, however, it may be a bit overwhelming when it first arrives. And especially when you see all the wonderful embellishments and accessories that come with it! So let me share with you my method for "deconstructing a bundle" and show you how you can create multiple projects with just one purchase. By going through a few simple steps, you can organize and plan your paper crafting projects, and get the most out of your crafting budget! Step 1. Organize your Designer Paper. On a large table, or work area, place the papers side by side in a big paper fan. I put mine in order of color, darkest to lightest. Since there are two sheets of each design paper in the bundle, you can actually see each and every paper when you do this. 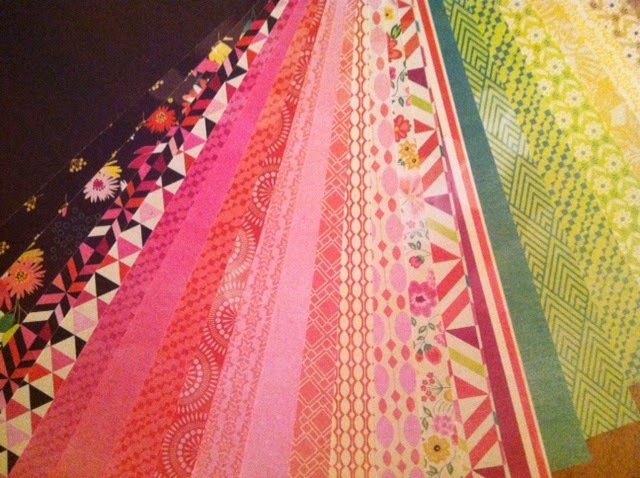 It gives you an idea of what colors you are working with, and ultimately which papers you will choose for your projects. There is a LOT MORE to a FotoBella I want it all Bundle than just paper! Lots more! 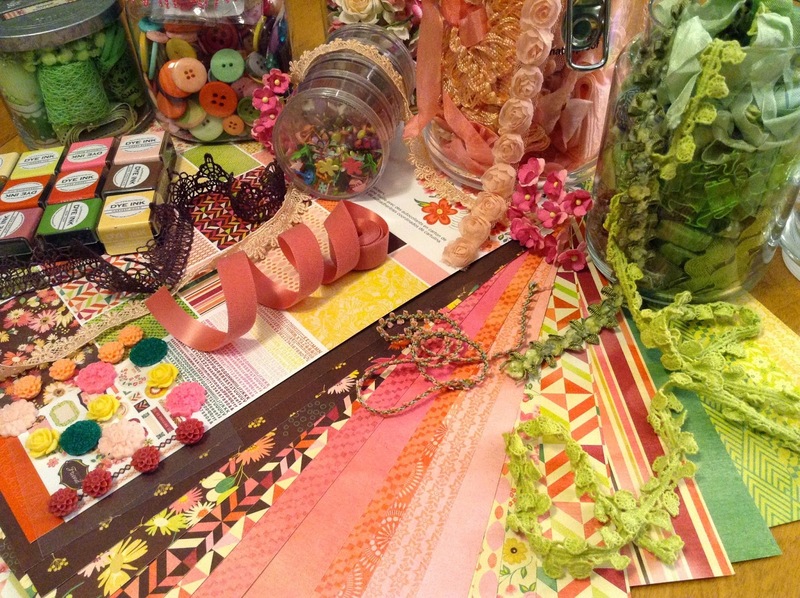 Open up all the packages of embellishments and lay them out on a big table. This allows you to actually see what you have to work with. You will be pleasantly surprised at how many wonderful stickers, chipboard pieces and other fun embellishments there are to a FotoBella bundle! Are your creative juices flowing yet? With the Vivienne Bundle, you receive acetate frames and embellishments. I would recommend putting a white piece of paper under the frames so that you can easily see their size, shape, and how cute they are! Keeping them stored in their packaging does NOT do them justice! At this point you can start to group similar items together, so that when you're designing your project you can find things easily. Move the pieces around, the ideas for projects will really start to happen now! Now it's time to integrate your own special style into the Collection. 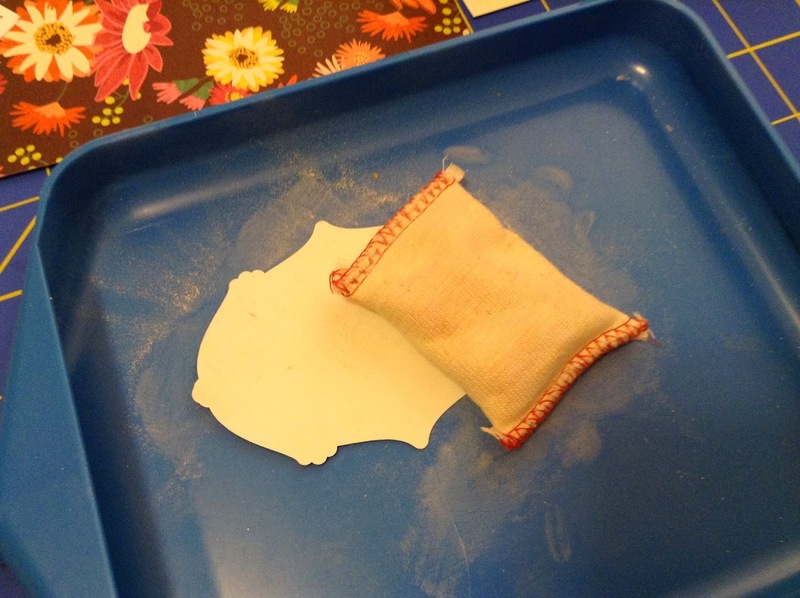 Chances are you have a "Stash" of supplies that you commonly use. Things that you use that add that signature touch to your projects. Find inks, ribbons, trims and buttons from your own stash and put them on the table with the Bundle. Look at all these gorgeous colors and textures! 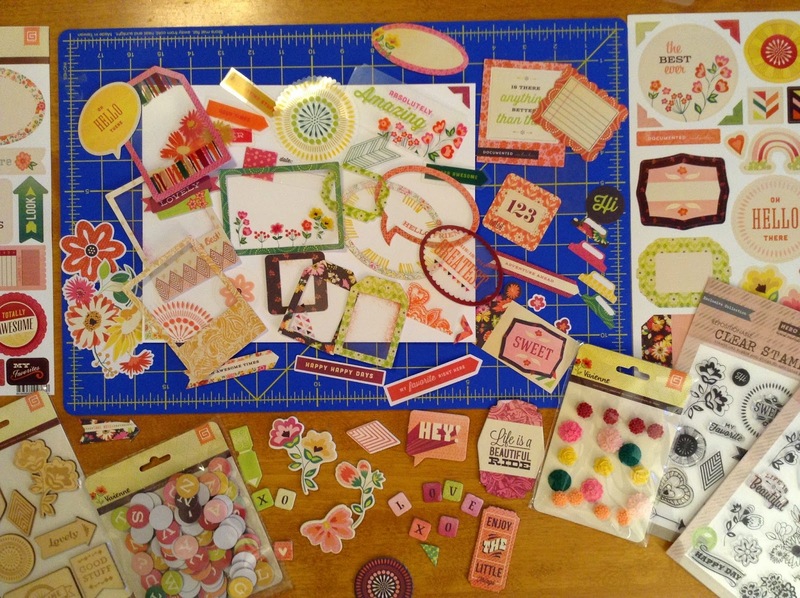 Can't you just imagine how pretty your projects will be with this Vivienne "I want it all Bundle"? 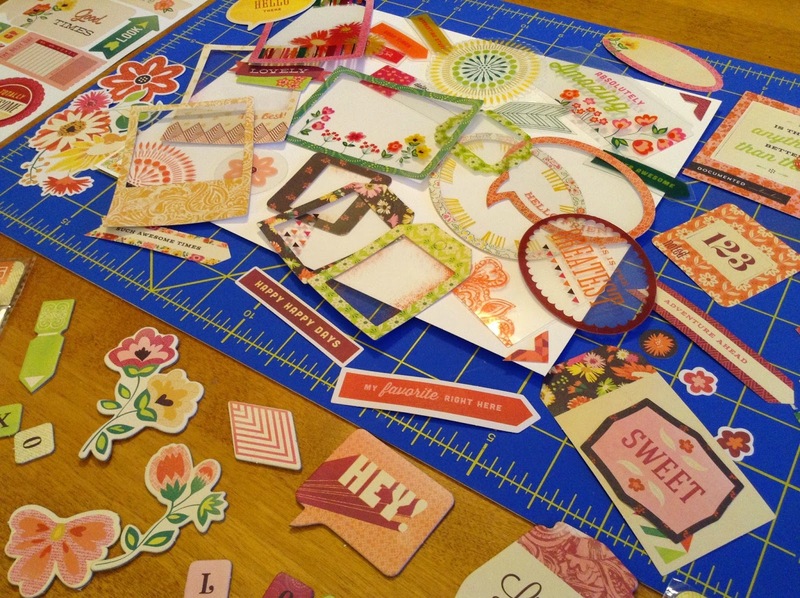 With so many wonderful papers and embellishments at your fingertips, it will be a breeze to create beautiful projects for your family and friends. So let's do just that! 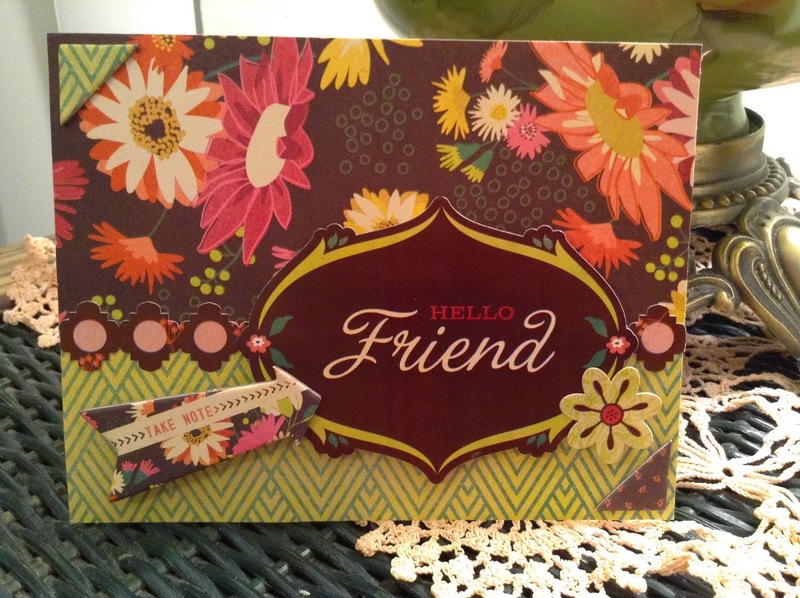 Here is a pretty Friendship card I made using only what was in the Bundle. It's quick and easy so let's get started! Begin with an A2 size card. A2 cards are 4 1/4" x 5 1/2". 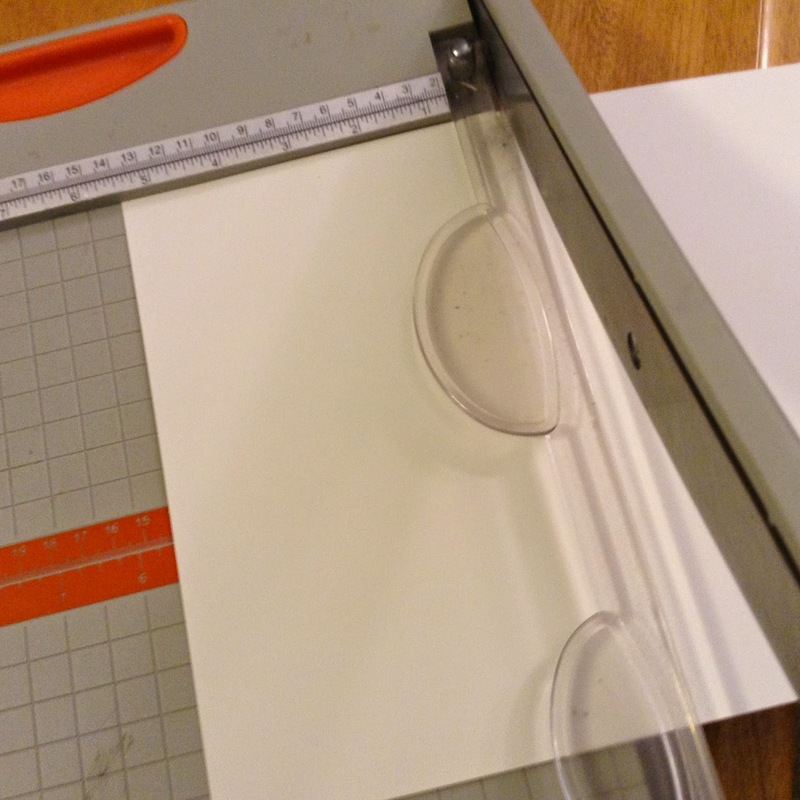 Cut a piece of 8 1/2" x 11" card stock in half horizontally. Make the cut as shown. 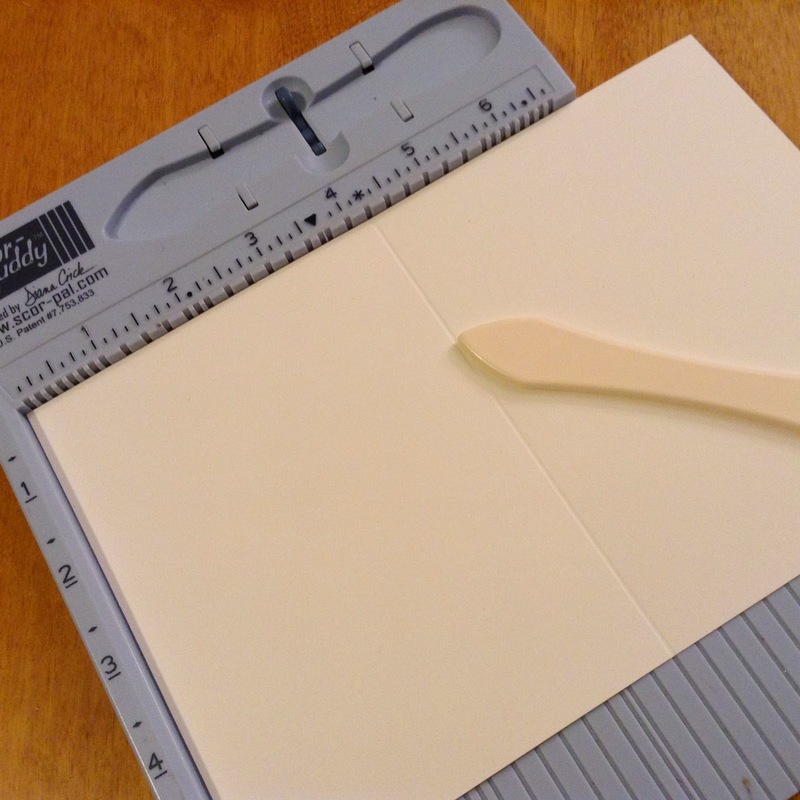 Score the card stock at 4 1/4" and burnish the fold with a bone folder. Cut two pieces of Design Paper as shown. 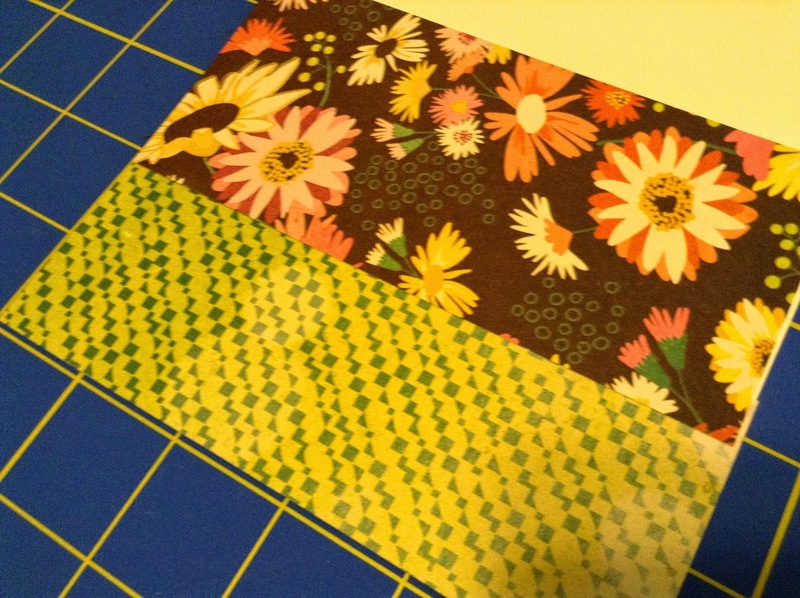 Brown patterned paper: 2 1/2" x 5 1/2", Green patterned paper: 2" x 5 1/2"
Set Sticker sheet next to your project. Adhere the Green patterned paper on the bottom half of the card. 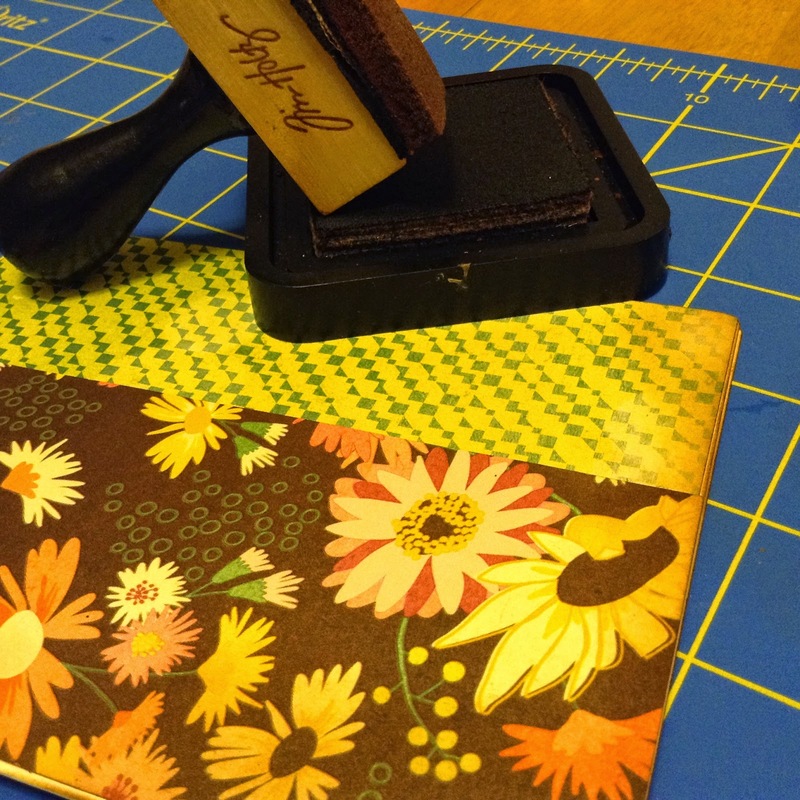 Adhere the Brown patterned paper to the top of the card. It will overlap the Green paper slightly. and adhere to the card on the line where the two papers meet. With Vintage Photo Ink, distress the edges of the card if desired. 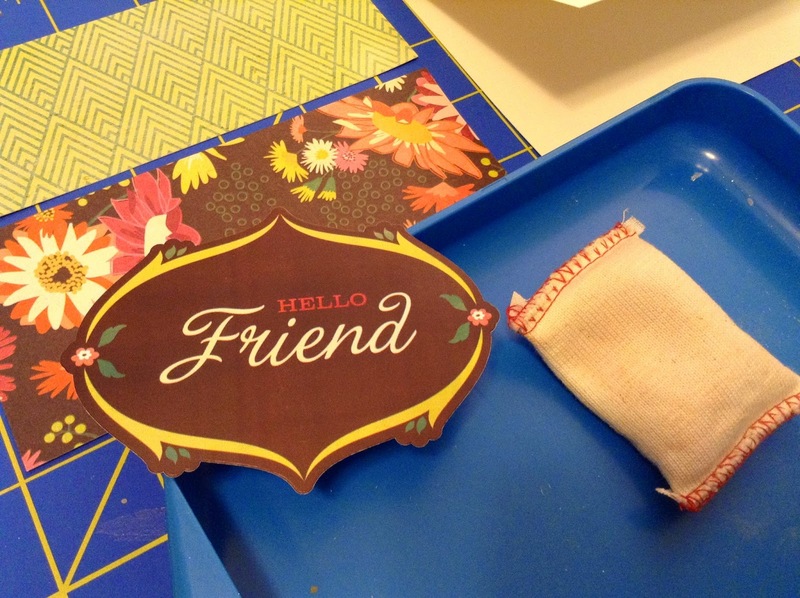 Remove the Friend sticker from the sticker sheet, and set on craft sheet or in a tray. 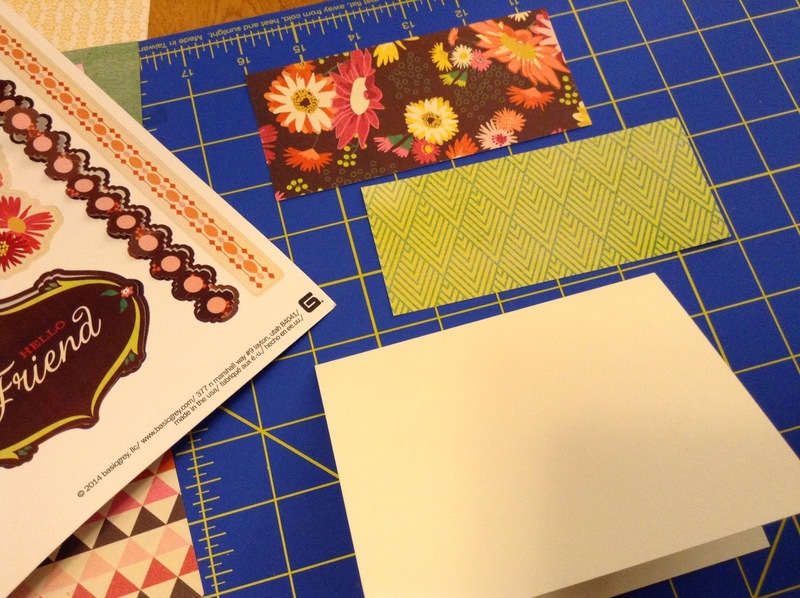 Using Pop Dots or dimensional tape, adhere the Sticker to card front, right along the seam line. Adhere the back of the arrow to the card with pop dots, and the front of the arrow to the Friend sticker. 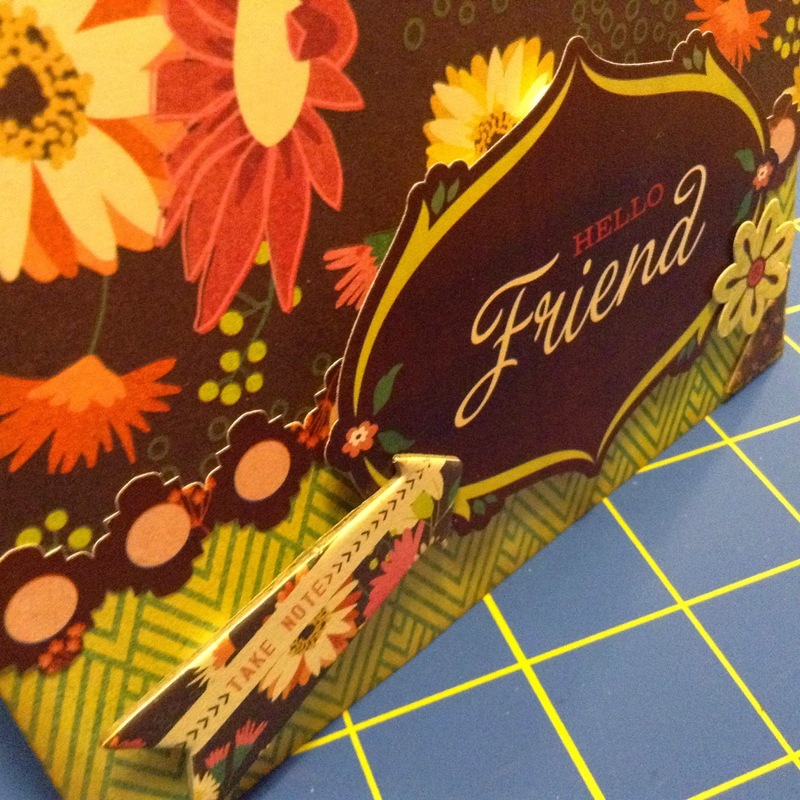 Adhere a green and brown chipboard "corner" to the card on opposite sides, and add a flower sticker. Add green gemstones in corners if desired. 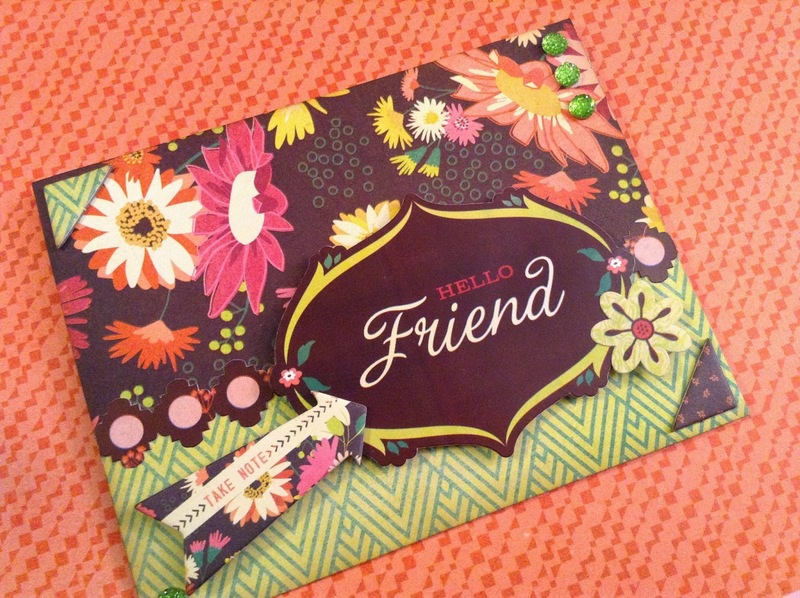 Now your card is ready to send to your best friend! The possibilities are endless with the Vivienne Bundle from Basic Grey! 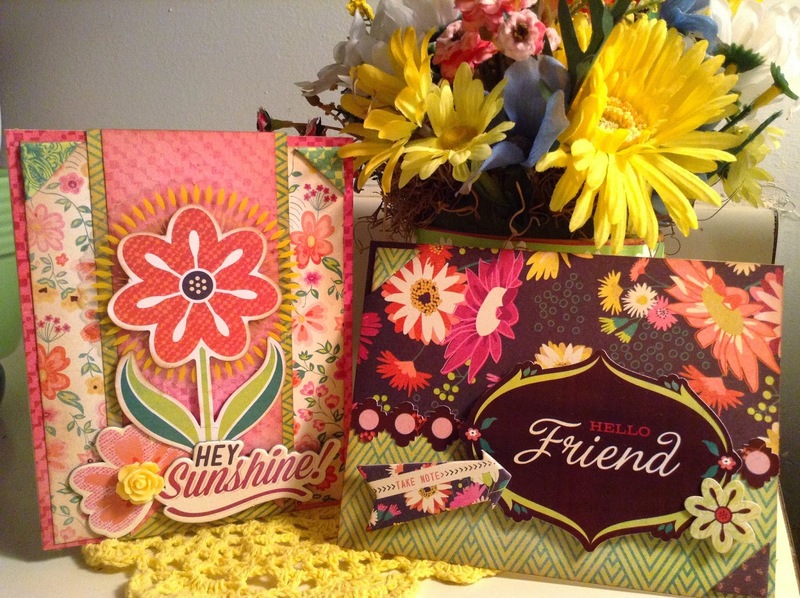 From Scrapbook pages, to home decor projects for your home, you will find countless ways to use this amazing bundle! And of course, it's just perfect for making cards. Great tutorial ReNae!! I love how you showed your process of working with the bundle! Fantastic cards too! These cards are really beautiful! Thank you Drea and Apryl! 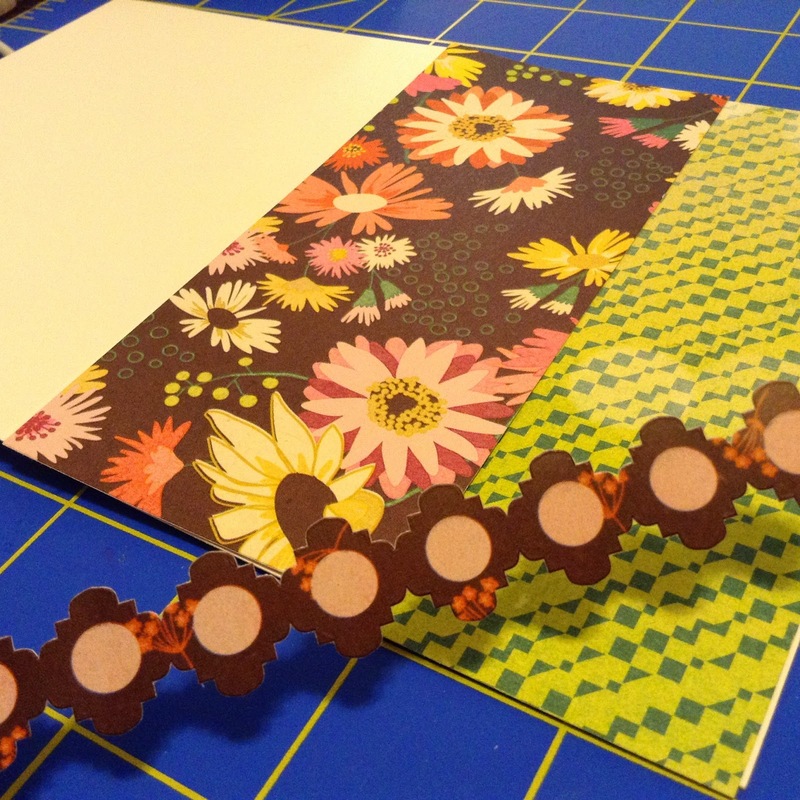 It is easy to create cute cards when the paper is so pretty!